Climb the Yellow Mountains, also known as Mt. 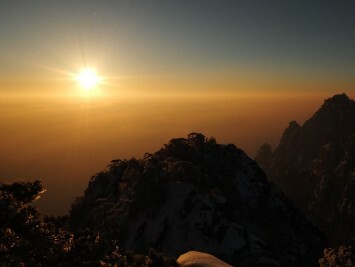 Huangshan, in just one day to enjoy the stunning scenery. Stay a night at the top and get up early to watch the sunrise, enjoy the summit by hiking around. Good to combine with a visit to Shanghai. How to get to Mt. Huangshan? Below we explained how to get to Huangshan by public transport. We devided it in 3 steps. Take a small bus from the Huangshan bus/trainstation (Huangshan is also called Tunxi) to Tangkou, departing every 20 minutes during daytime. 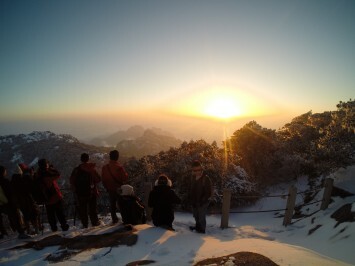 Tangkou is the closest village to Huangshan mountain. 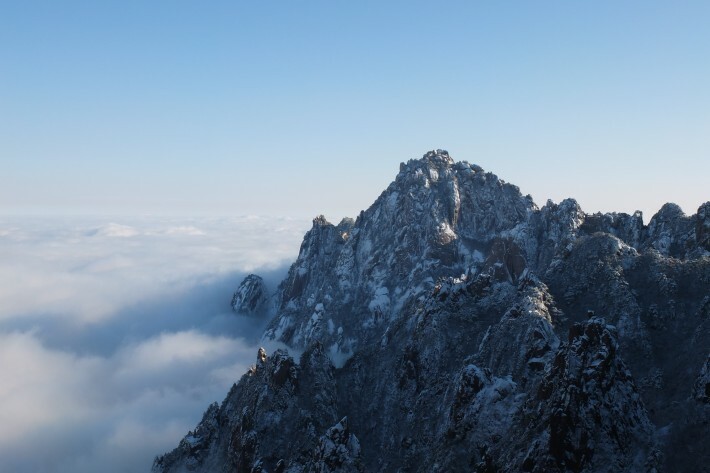 It is a bit confusing, but a city and the mountain are both called Huangshan, which means Yellow Mountain, however the closest village to the mountain is not Huangshan-city but it is Tangkou. Find a way to the Tangkou busstation (for us it was a 3 minute walk from where we were dropped of by the last bus). 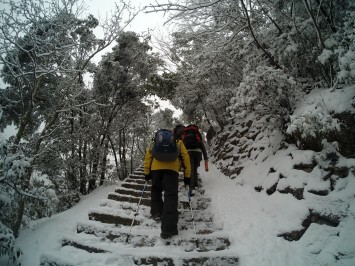 Take the bus from Tangkou busstation to Huangshan mountain. Or walk to the mountain. Decide whether you are going to hike all the way to the summit (takes about 5 hours in a relaxed tempo, you need an average condition) or take the cableway. 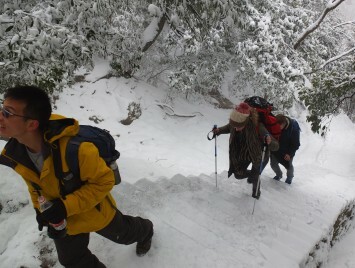 We strongly recommend to hike to the summit if your health allows it, it really is a surplus for your whole experience. Decide if you will stay a night or more at the top, when hiking this is recommended. Drop your stuff which is not needed at the mountain in a restaurant or hotel down there in Tangkou village. Don’t forget to get a proof that you dropped your stuff there. Buy enough food and drinks, food and drinks are relatively expensive at the summit (European prices at the summit). Entree fee for this national park: 140 RMB (around €17). Take the Western steps, those are far more peaceful in compare to the East steps. 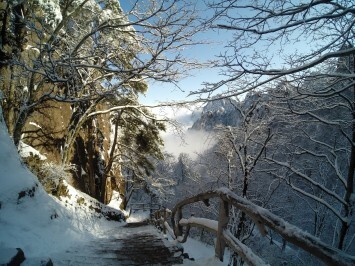 The Western steps are also better for hiking all the way up. It can be convenient to buy a map of the mountains in Tangkou village. At the top there are a lot of routes to walk, unfortantely I can’t inform you about this because they were all closed because of the snow that time. Take the Eastern steps to go down, in our case there were a lot of Chinese tourists here. At the top there are a few hotels. As far as we know those hotels are owned by the Chinese government. Because of their monopoly they lifted up the prices, which makes it quite expensive. 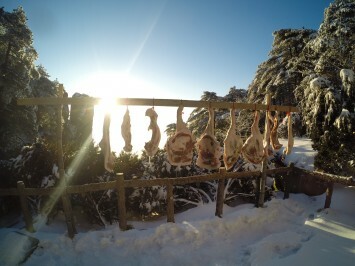 Lucky enough we meat a Chinese guy who wanted to help us during our days at Huangshan. He asked at the ‘Baiyun Hotel’ for a cheap kind of storage room to sleep for a night. And yes, that was a crap room, but good for us. For only 45 RMB we slept there, there was place for 8 persons in a 12 m² room, with a small heater. 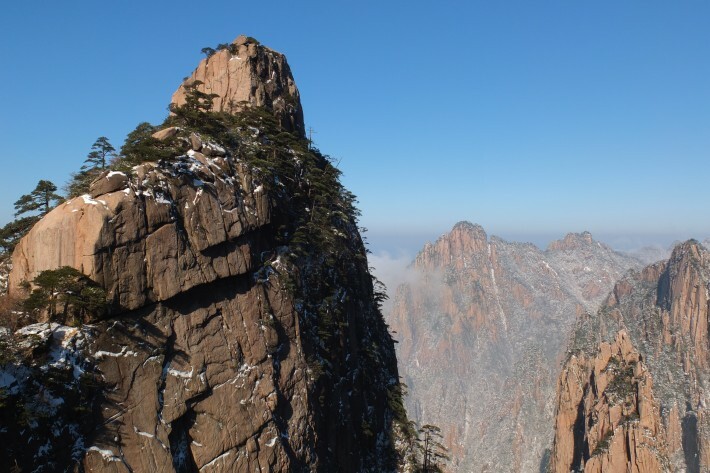 Your trip doesn’t stop after Huangshan? 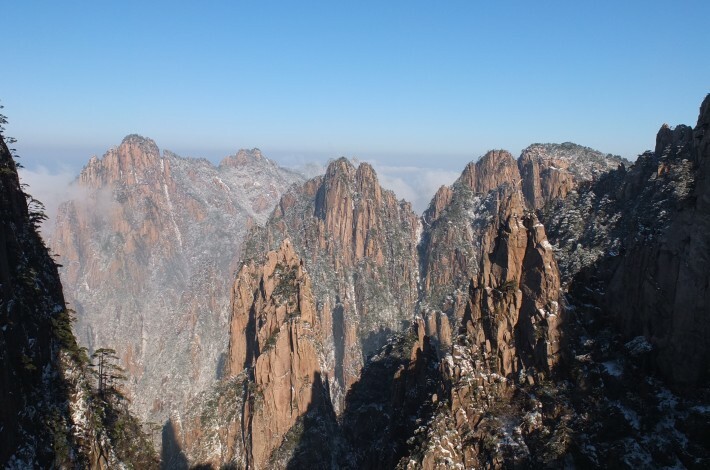 Here are some tips for destinations close to Huangshan, or just good to combine with Huangshan.